Seeking truthful and serious traditional instruction, I came to study, many years ago, under master Zhou’s student, Nitzan Oren – a fellow Israeli, and nowadays also a dear friend. Later, on two occasions, I have had the chance to study directly under Zhou shifu. 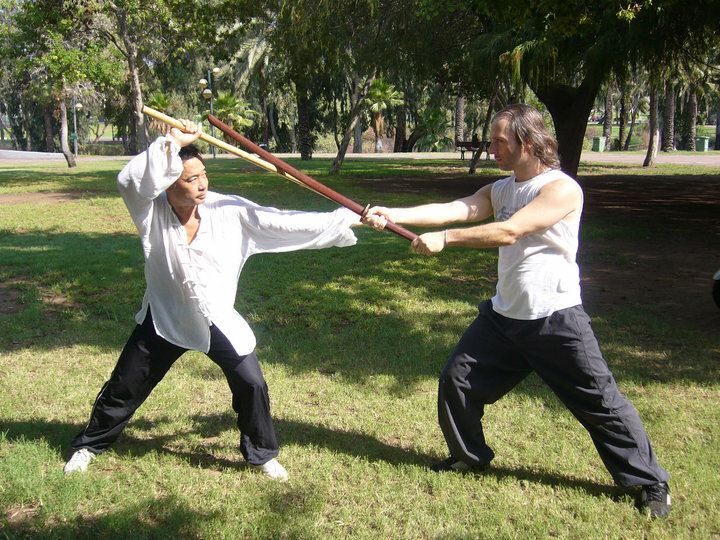 With both teachers I have studied Xing Yi Quan and Pigua Zhang. My latest training period with Zhou had been for 40 days of daily training, during summer 2012. 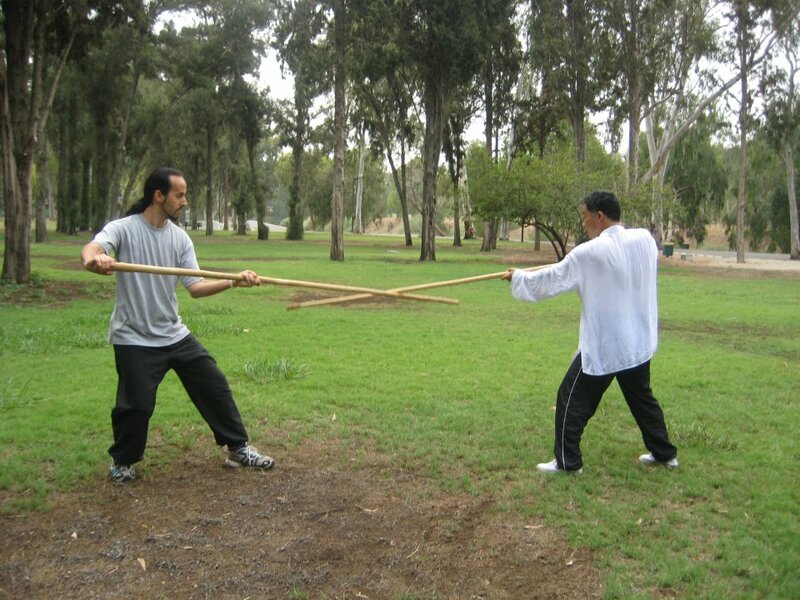 Prior to that, I have also trained daily with Zhou shifu for a month in summer 2010, when he had come to Israel to instruct his Israeli students and their students. 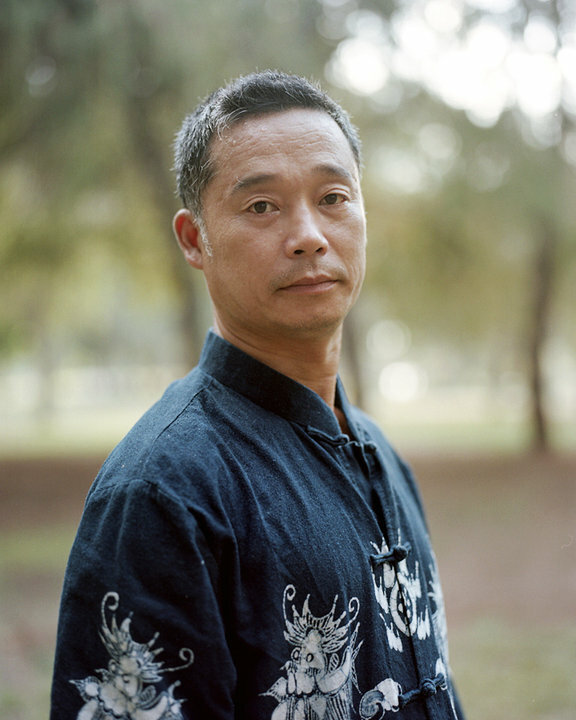 Master Zhou, now about 48 years old, was born and had lived all of his life in Tianjin city, China. Today, Tianjin is a booming metropolis of 13 million people, with infrastructure and facilities no less impressive that those of famous European cities (albeit its pollution being quite terrible). But at its core, Tianjin is an ancient city, and up until 30 years ago, it was still quite primitive in its construction and accommodations, not to mention the living standards, which were quite fitting to a third-world country. And, while culture in some respects has always flourished, either above or below the surface, the mentality and mindset of most of this city’s inhabitants was always that of the poor and struggling. Even today, it can be said that large portions of the city are one big ‘rough neighborhood’. This is the environment Zhou had grown up and still lives in – a place which builds character, psychological endurance, and sharp survivalist instincts. In 1931, the Empire of Japan had invaded Manchuria, with the goal of conquering all of China, marking the (true) beginning of World War II. The China that had been invaded had been at its weakest point in many centuries, following 200~ years of economic conquest by Western powers, and a succession of terrible civil wars. 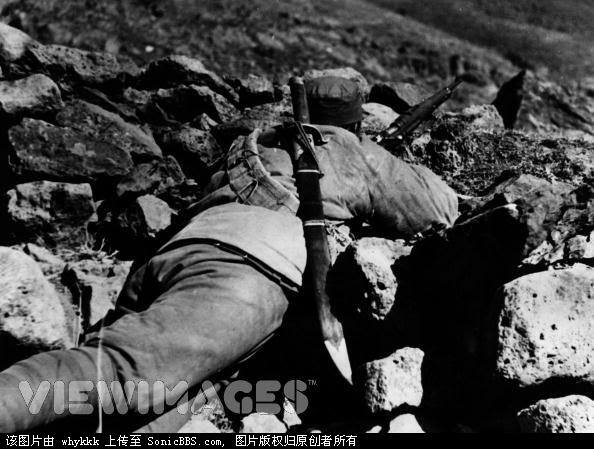 The Chinese barely survived the war, in which the Japanese Imperial Army was not only close to occupying all of China, but performed some of the worst atrocities and war crimes in modern times, including mass murders and rapes of thousands and tens of thousands of people at a time. 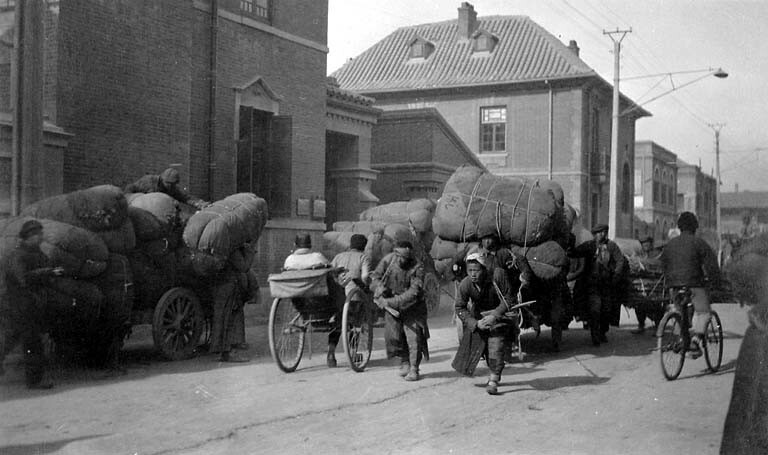 Tianjin suffered greatly from this occupation, and so had Zhou’s family. His grandfather in turn, set out to fight the Japanese. The Chinese army was so scarce in resources, that it was frequent that the soldiers would run out of ammunition, or lack firearms altogether. The 29th army, which Zhou’s grandfather joined, had therefore experimentally equipped their soldiers with additional weapons – Dao and Da Dao swords, to fight the Japanese at close quarters, or when the ammunition would run out. It is almost unthought of that in the age of automatic and semi-automatic guns, that people would be fighting against such weapons with swords, but the 29th army did so quite successfully. Zhou’s grandfather survived the war, at the cost of seeing all his friends being killed by the Japanese. It seems to me that this traumatic experience of the most brutal kid of fighting had undoubtedly affected young Zhou shifu, who took to heart the lessons of war and violence. 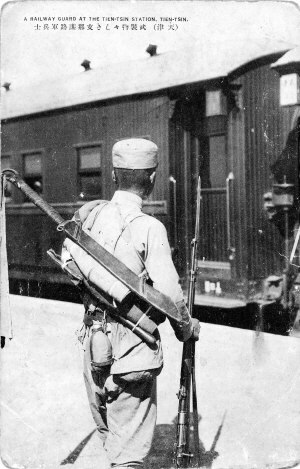 Another soldier of the 29th army, carrying Dao swords on his back. For Zhou, it was obvious from a young age that he was going to practice martial arts. The district he was lives in, Hong Qiao, is one of two districts in the city of Tiajin famous for their martial artists (the other being Nankai). He lived (and still lives) near Xigupark – an impressive island of greenery in the middle of gray Tianjin, which had over the years become an attraction point for many martial artists. The teaching atmosphere was very different from other places, especially compared to schools in modern times. People simply came to the park and practiced. You could have a choice from many teachers, and if you had the right connections, also be recommended by your own teachers to become a student of others. Because of these unique circumstances, Zhou had the opportunity to get to know hundreds of highly-skilled martial arts teachers in his lifetime, and study under quite a few of them. Beginning at age 9, Zhou started his studies with the arts of Chuo Jiao, Fanzi Quan and Tan Tui. 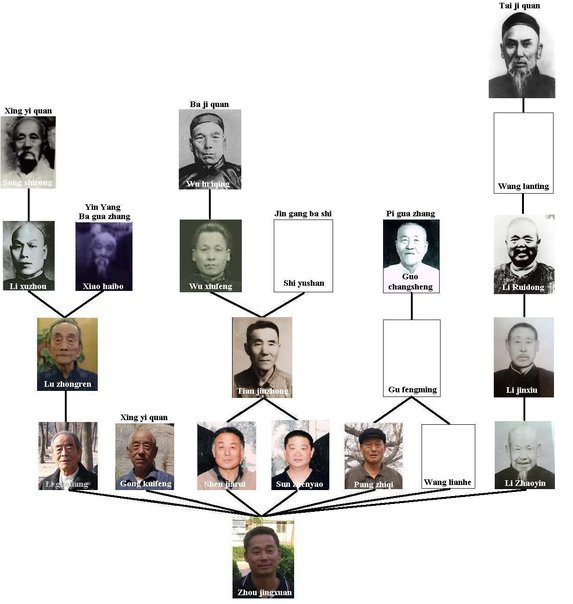 Later, he also learned Pigua Zhang (under two teachers), Xing Yi Quan (under four teachers), and Baji Quan and Jingang Bashi (under two teachers who are gongfu brothers) and Li style Taiji Quan. Additionally, all of Zhou’s teachers taught him several weapon forms, each. Some of these weapons are related to the arts he had studied, while others (such as the Six Harmonies Spear form) are interdependent from style. Overall, Zhou shifu ended up having 11 long-term teachers, out of which he became an official disciple (indoor student) of 7 of them. 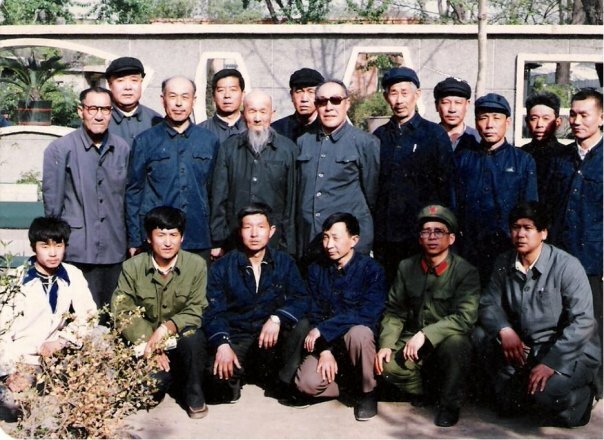 Members of Zhou’s gongfu family – practitioners of Baji Quan and Jingang Bashi, together with members of the Communist Party. Circa 1980s. Zhou is sitting in the front row, on the far left, wearing a white shirt. Behind Zhou stands his grand-teacher, Tian Jinzhong, wearing glasses. To Tian’s left stands another grand-teacher of Zhou’s – Zhao Fujiang (bald man with dark-blue shirt), who was master Tian’s younger gongfu brother in their Baji lineage. As a child, Zhou was mischievous and adventurous. This had probably been his way of coping with the harsh living conditions in Tianjin, past the Cultural Revolution (a time of great poverty and death throughout China). The country was difficult to survive in, and life was chaotic at times. People had to learn how to endure and manage, and teach these skills to their families as well. Thus, beginning when Zhou began his martial arts learning at the age of 9, and through his teenage years and early 20s, he was involved in a lot of fights that were forced upon him by others. Times have since changed, China and Tianjin have become relatively safer places, and Zhou have since turned more peaceful in nature. Also in accordance with the times, Zhou has since been accepting students with all types of goals in training – not just martial; enjoying teaching people who may seek learning the arts for self-preservation and development as well. He himself has too begun to practice more health-oriented methods over the years, to balance his previous martial experience. Zhou’s previous martial experiences are still evident though, when demonstrating the proper execution of movements and martial techniques – with a fierceness of a true fighting scenario. 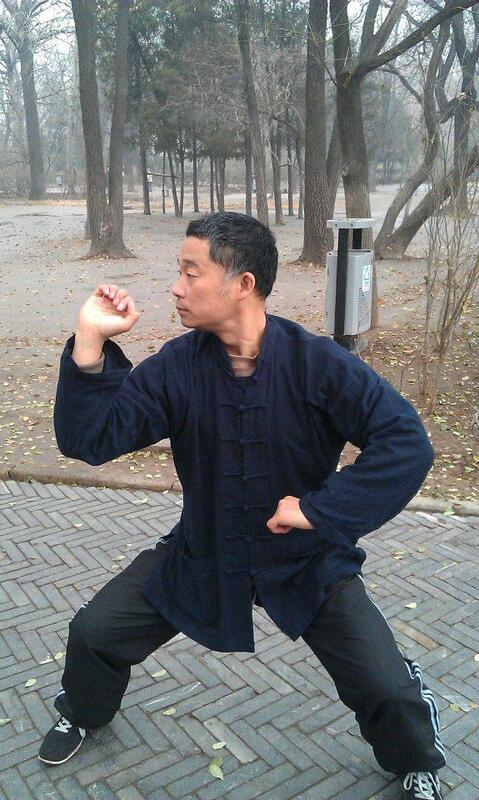 When Zhou was a young teenager, he recalls, there was a certain Taiji Quan teacher in the park. To Zhou and his friends, he was a target for ridicule, as he looked funny, and they did not think much of the slow movements he had been practicing. The old man, on his part, did not mind at all the children’s behaviour, and completely ignored them. They used to come at him in the park when he was not training, and try to push him over. Zhou vividly remembers how, despite their best attempts, they could not do anything to him. Whenever they pushed on him, his body would collapse and absorb their energy with no apparent effort. Those who used too much force on him would be bounced back on into the ground by their own strength and momentum. Today, Zhou is stricken by this silliness and his disrespect towards the old man, when he was younger. He says: “I wish I was wiser, and would have gone to study under this man, as he had obviously possessed a great skill in the martial arts”. Such experiences, as well as Zhou’s tutelage by many teachers over the yearshave made him garner much respect towards other arts and martial artists. It is difficult, and often impossible, to make Zhou shifu speak badly of other people and their arts. He could go in-length for many minutes on end, on the wonderful skills of practitioners which he thinks highly of. But ask him of someone who is not skilled or is not a good person, and Zhou would rather say he does not know enough about this person or his martial art, than speak badly of them. He also regrets not having the chance or the time to practice under or with martial artists of styles he has not learned. While Zhou is very satisfied and enthusiastic about the styles he practices and teaches, this yearning for more knowledge is derived from his great appreciation of other practitioners and their arts. Having trained in Xigu park since childhood (and later started teaching there), Zhou is a very familiar figure in the park. It seems that most people who gothereknow him somehow – if not by name, at least by recognizing his face and composure. Since his youth, he has also been famous around his neighborhood for his excellent skills in Pigua Zhang. In Chinese society, where one’s name, Ego and ‘Face’ often play a huge role, it is rare that people publicly ask others, who are not their own teachers, to instruct them. Such an act would, in this traditional society, indicate that the person asking instruction is ‘lesser’ or even ‘inferior’ to the other. Nonetheless, I have myself seen many people in the park approach Zhou shifu, asking him to teach them little something here and there, or to correct their practice. I have also been witness to several parents who came to Zhou, and asked him to formally accept their children as his students. These parents were interested in the physical well-being of their children – their health and ability to protect themselves, and also in exposing their children to traditional Chinese culture, in an age in which most Chinese children are more interested in imitating American culture. China at large has suffered from two centuries of Economic and Military occupation by Western powers. 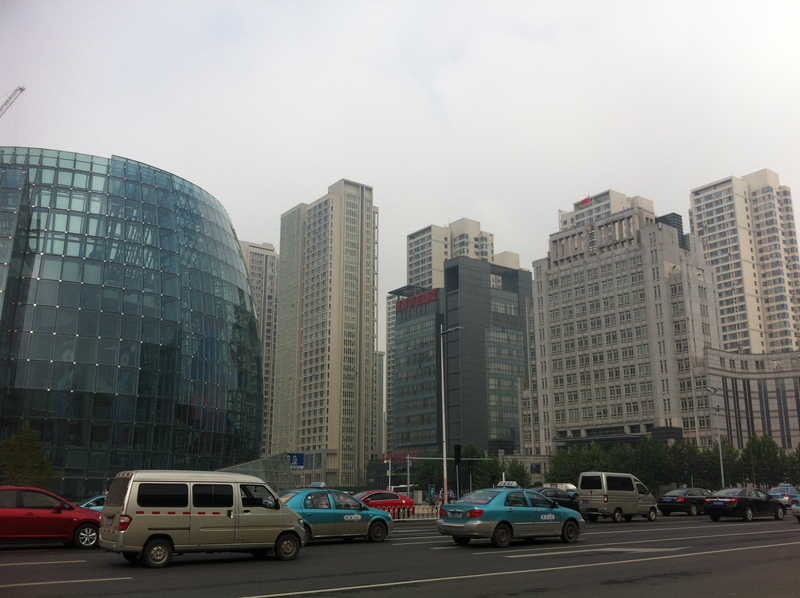 The very center of this ugly takeover was the city of Tianjin, which still features several neighbourhoods with lots of Western-style architecture, reminiscent of 19th century Europe. These times were then followed by several decades of strict Communist rule, which was also anti-Western in ideology, and actively fought the West in the Korean War and during the Cold War. That said, it was to be expected that the older Chinese generations would not think highly of Westerns. Neither did Zhou think too positively of Westerners, when he was younger. Having never learned a foreign language or known a Westerner as a friend, like most of the Chinese of his generation, his opinion of Westerners was shaped by the bloody, turbulent history of China over her last few centuries. While one could hardly suggest that this social mindset was stained by harsh things like Racism, one could say that suspicion, prejudice and bias are definitely common in this society towards foreigners.Which is perfectly understandable, by the way, considering their historical circumstances, and China’s isolation from the Western world throughout most of the last 100 years. Zhou shifu, with one of his top students, Nitzan Oren from Israel. HaYarkon Park, Tel-Aviv, Israel, August 2010. I believe that Zhou’s ideas about foreigners must have taken their first shift once he began to teach Westerners in the 1990s. Slowly but surely, he came to understand that they were not at all as bad as they were always portrayed to be when he was younger. A major change of heart was in the years following Zhou’s acquaintance with my teacher, Nitzan Oren. At the time, and also nowadays, Zhou have had trouble with students leaving his side before they could learn a reasonable amount of martial material and skills.Most of the young Chinese tend to neglect serious martial arts practice, possibly because Zhou is more readily available to them (don’t appreciate him enough because of that), and also because the pursuit of careers and finance is of a greater interest to them than training. Few of Zhou’s Chinese students have stuck around for over 2-3 years, and those who did, usually never trained as hard as Zhou had probably hoped for. One Chinese female student of Zhou had stayed with him for 11 years, and had reached a very good level. Unfortunately, she quit training altogether once she got married (as commonly happens in Chinese society, which is still very chauvinistic compared to the West). 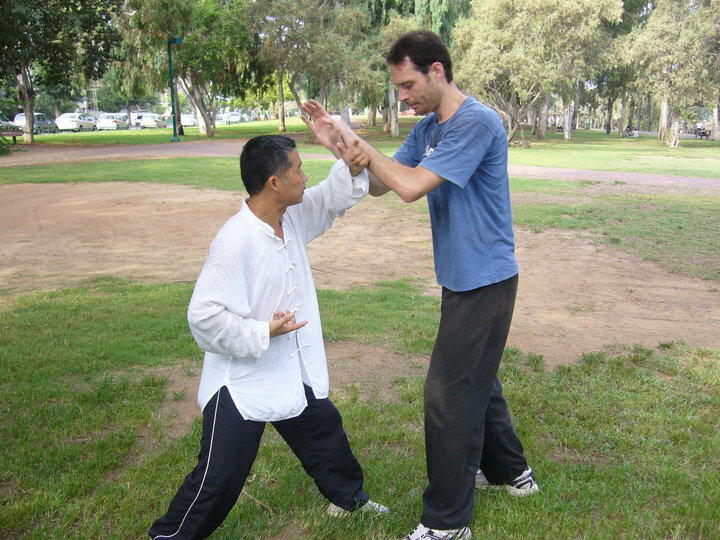 Zhou shifu, with one of his top students, Ben Bario from Israel.HaYarkon Park, Tel-Aviv, Israel, August 2010. Nitzan was the exception, remaining by Zhou’s side for 7 years straight, and studying with him daily. It was the first time that Zhou had had such a serious-minded student. In the beginning, Zhou still carried some cultural biases and prejudices towards Westerners. Over time though, Nitzan’s persistence and perseverance have made him change his mind about Westerners. Following Nitzan, more and more Westerners came to study with Zhou. He then noticed that, not only were these people willing to come all the way from another continent to train with him, some of them also invested more effort in their training than many of his Chinese students. He also figured that these Westerners were genuinely interested in traditional Chinese culture, which ironically, many of the younger Chinese were now throwing away, in favour of chasing fantasies related to the Consumerism and Hedonism of the globalized “American” culture. In an age in which the Chinese are quickly losing their own cultural roots, Zhou has found comfort in knowing that there are foreigners willing to put in the time and effort, to preserve what is dear to him, besides his few dedicated Chinese students. That is why, as a mature adult, he had a drastic change in some of the ideologies he had been indoctrinated into since early childhood, and have come to accept Westerners as equals, and decent people. To the extent that at such an age (when he was over 35), a person is willing to consciously have this big a change of heart, is in my opinion a wonderful testimony to Zhou’s pragmatic, humble and down-to-earth character. In our time, many Chinese (in mainland China) treat foreigners nicely, but think and speak badly of them behind their backs, as a result of the education they had been receiving from youth (though the situation is improving, and there are also many Chinese who are most welcoming and kind towards foreigners). Zhou has transcended that nationalistic mentality, and have come to accept Westerners without prejudice or bias. That sort of attitude may ‘go without saying’ for a person educated in the safe confines of a Liberal Democracy, but for a person who has been brainwashed all his life as a citizen of a Totalitarian state, this is not at all obvious. Today, Zhou has many foreign students worldwide, and takes great pride in all of them. Zhou shifu teaching Ilan – a 3rd Dan Aikidoka from Israel.HaYarkon Park, Tel-Aviv, Israel, August 2010. There are some teachers who have had more influence over Zhou than others. One such teacher, which he holds in high esteem, is master Li Guoliang (of Tianjin; there is another known teacher by the same name from Taigu, whose name is written with different characters in Chinese). From master Li, Zhou had received much of his knowledge of Xing Yi Quan – a lot of which is rarely seen elsewhere nowadays, and have also gained the deep foundations in Zhan Zhuang (standing post) training. These teachings have deeply affected the way Zhou shifu practices and teaches martial arts. Zhan Zhuang, and other skills taught by master Li, are now ‘obligatory material’ for any student who comes to study under Zhou (with proper, specific adaptations being made for the particular martial art the student is practicing). Zhou considers the Zhan Zhuang training to be the most important, and have told his students that: “Even if one cannot practice at all on a certain day, it’s still vital that one would somehow make time for practicing Zhan Zhuang for at least 20 minutes”. Another skillset that Zhou would teach, to advanced students, are his Dan Tian development methods, which he had learned from several teachers, but in particular and most of all from Zhao Fujiang (one of his grand-teachers). To train these, one first needs a solid foundation in Zhan Zhuang, which requires prolonged daily practice. 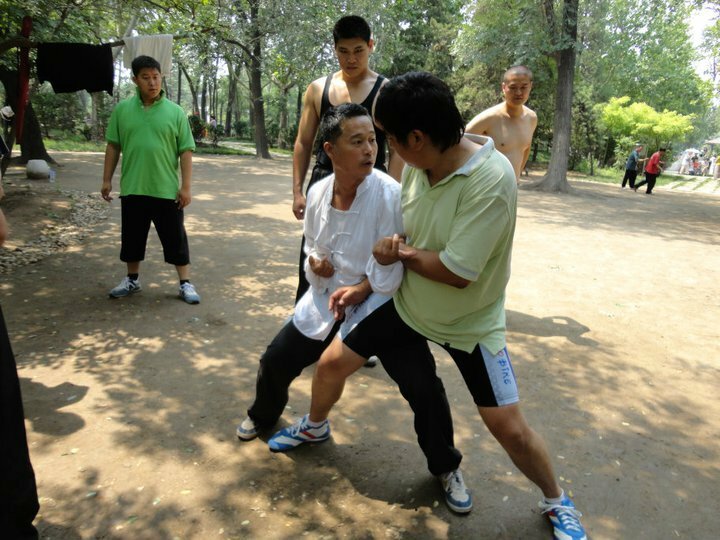 The Dan Tian methods can then be introduced, and later be implemented and embedded into any of the arts Zhou teaches, in most fighting movement. Master Zhou is also a big exponent of the notion of Quality being more important than Quantity. Although he himself have studied many arts, he had dedicates several years, and many hours a day, for the practice of each of these arts. Therefore, it is important to him that student spend the time required to hone their ability with each method, drill or technique, before they move on to learn more material. That said, Zhou is pragmatic in his approach, and does not force the students to abide by his wishes. Nor does he even force anyone to study a particular art or skill, and the final choice is up to the student. His words are a hearty recommendation – one’s that’s often better adopted, but is not strictly dictated or enforced. A student’s free will and self-actualization is, eventually, what’s most important to Zhou when he teachers. Master Zhou, demonstrating application with his Israeli student, Etai. During this particular moment, Zhou was showing how proper alignment and structure, as developed through Zhan Zhuang training, can make it easy for a small person to resist a much larger individual. Zhou is roughly 5’6 in height, and Etai is 6’4. HaYarkon Park, Tel-Aviv, Israel, August 2010. Because many of the higher-level skills Zhou has learned had originated from his Xing Yi Quan practice methods, and possibly because of his teacher’s requests, Zhou refrains from allowing video of his Xing Yi to be taken. It is a shame, as his Xing Yi truly exceptional. I remember vividly how I watched Zhou demonstrate things with his Xing Yi that others only speak of. For example – many people have written of the difference between ‘Ming Jin’ (obvious power) and ‘An Jin’ (hidden power) in the art. Few teachers, though, can show the difference well. Zhou once demonstrated this difference to us students, using the same movement – Pi Quan – Xing Yi’s most basic movement. The first variation, of ‘obvious’ power, had cut through the air like a baseball bat making a home-run. It was blunt, solid, sharp and defined. Then he delivered the ‘hidden power’ variation, which is of the higher level. It shot away like lightning tearing a gap in the air, lashing out with a true killing intent, which was at once both subtle and frightening. Myself, I could demonstrate this too, but certainly not as brilliantly as master Zhou does. In his demonstration, even though he had not touched anyone, you could feel the differentiation of spirit and intent behind the movements in a very distinct fashion. Another time, I’ve had the ‘privilege’ of Zhou asking me to try and use short-power striking (Cun Jin) on him. This meant I needed to shock him with a strike from zero distance – my hand already on his chest. I was not skilled enough at the time, and Zhou was not satisfied with my power. I could not at all affect him. He then asked me to be his dummy. I was to stand in a strong stance, and flex my chest muscles as he was about to release his force on the side of them. As he did, I felt nothing on the surface of my skin, and he barely seemed to move at all. It was as if he had touched me with cotton. From roughly the middle of his striking palm, it felt as if a very thin needle had dug deep into my chest, and within it had carried an explosive charge, which was then detonated as it had reached the middle of my torso through the route set by the ‘needle’. For a split of a second, I felt Death. Psychologically, the closest sensation I could think of is when one vomits badly when one is very ill, and momentarily feels like he is about to die. That is somewhat how I felt – for a moment, as if my game was over; there wasn’t even enough time to fear what was going on – it was only the knowledge of impending doom that was quick enough to enter my consciousness. Luckily, master Zhou knows what he’s doing, and did not shock me with his full capacity. Neither was there any damage or pain following the moment of the strike. Still, this was a humbling experience, which had made me realize some of the true potential of what Zhou is teaching. 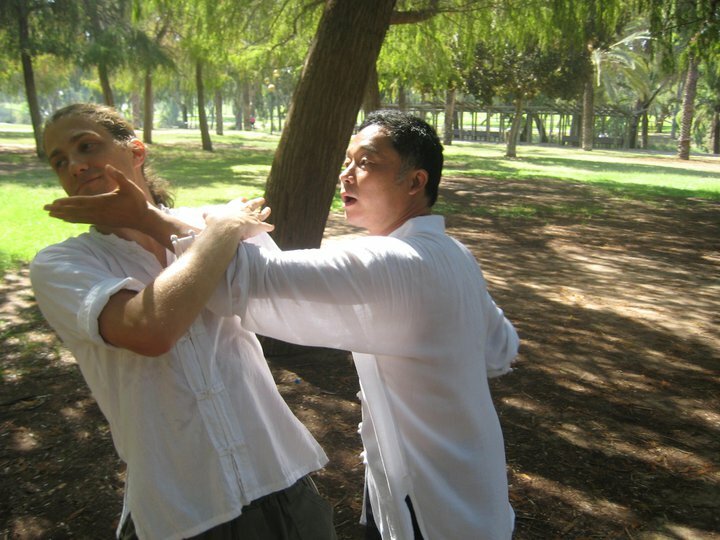 Zhou shifu, demonstrating an application on Tom, one of his Israeli students. HaYarkon Park, Tel-Aviv, Israel, August 2010. This all reflect Zhou’s liking for the hands-on teaching approach. He rightfully believes that in order to truly understand martial arts, the student must feel them. This means, beyond the obvious, that the student should have free access to touching Zhou’s body when he performs movements, to get a sense of how the body is supposed to move; also, that the student be able to execute the techniques on Zhou himself. These things are absolutely essential for learning Zhou’s martial arts. They also expose the intimacy of the relationship between Zhou and his committed students – with both sides expected to openly ask any question, and not shy away from physical contact. This is the traditional manner in which many Chinese martial arts were taught, but this approach is becoming exceedingly rare in the teaching of traditional martial arts; especially in the West and in Japan, where because of cultural politeness and social norms, many prefer a more ‘sterile’ learning environment and a teacher that keeps his distance and plays the role of an ‘authority figure’. Zhou would have none of that, and would never claim to be an authority on anything, or expect a better treatment by anyone because he is a teacher. Now closing in on his 50s, measuring by his skill and power, one could never guess. He would still casually perform splits, move faster than any of his students, exert a greater amount of force than them in his strikes, and easily toss people weighing twice his weight. Other things Zhou can do are, too, out of the ordinary. By the power of his mental intent alone, for example, he could make the hairs on his hand stand erect or fall (these are moved by tiny muscles under the skin, which in medical literature are said not be under one’s conscious control). I have also seen Zhou using mere one or two fingers to strike people in demonstrations, making them collapse sideways or to the ground at a great velocity because of the shock. Zhou shifu, teaching Baji Quan to a group of Chinese students. All of them are bigger and heavier than him. The Chinese guy standing directly behind Zhou is Xiao Hei – a national Western-Boxing champion, who is 6’3 and weighs twice Zhou’s weight. Fujian White Crane Kung Fu, once known as Tiger Crane Combination Kung Fu comes from Fujian Province in China. Fujian Province is famous throughout China for its flamboyant, fierce and efficient White Crane Kung Fu styles. For the sake of simplicity, it is known as Fujian White Crane Kung Fu in the West. It is the complete system of White Crane (the tiger stance providing a strong base for the more flamboyant hand techniques of the crane). Created by a female martial artist called Fang Qi Niang it incorporates fighting principles to suit every body type and personality, and has a defense to counter various attacks. The characteristics of this style are deep rooted stances, intricate hand techniques and fighting mostly at close range. 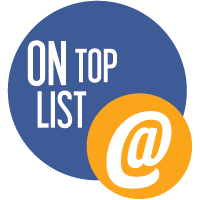 Because of its complexity, the system is often known as a “scholar’s style”, suitable for students who wish to take their skill to the highest possible level. The efficiency and practicality of the Crane system is such that a number of other styles have borrowed elements of this style to make those styles more effective. The Crane is a Chinese symbol of happiness and longevity and Crane style exercises are renowned in China for improving the general wellbeing of the practitioner. As well as the muscle groups, Fujian White Crane Kung Fu exercises increase flexibility, improve lung capacity, strengthen the joints and increase bone density. If you’re interested in studying Fujian White Crane Kung Fu full-time in China visit the http://www.StudyMartialArts.Org website there you will find a host of masters and martial arts schools where you can learn traditional Chinese Martial Arts.